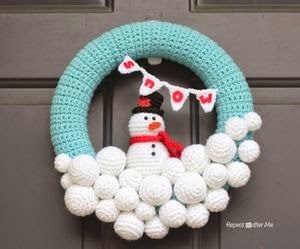 I am so torn between making a wreath this year, either crocheted like this adorable snowman wreath, or made entirely out of pom poms which would give me an excuse to use the pom pom makers I got over a month ago and still haven't got out of the packaging, oops! I love how simple the blue and white colour scheme works in this wreath. 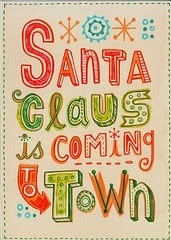 Doesn't this picture alone make you want to make something christmassy and fun!? Every year I do love working with felt, but my current decoration patterns aren't nearly as inspiring as the busy and fun garlad here, with so much mixed media as well to look just so unique. You can even find some helpful patterns on the original post from this picture. 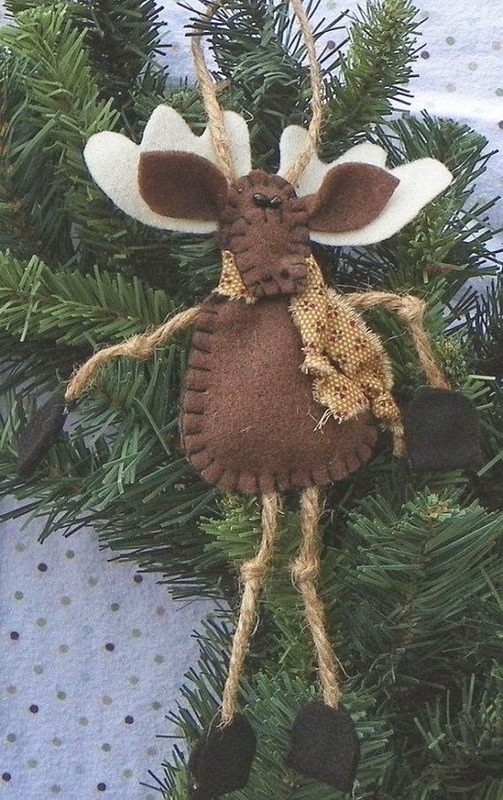 This moose decoration is really full of character, looks really easy to make, and is one of those slightly uncoventional tree decorations that looks just like it belongs on a tree along with the usual baubles and fairy lights! So comfortable and adorable! And finally this week I will leave you with some gift wrapping inspiration, as half the fun of giving a gift is making it look almost too good to open (almost!). 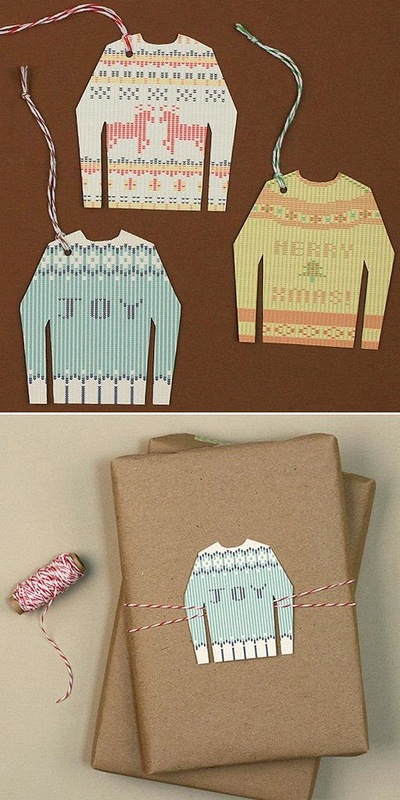 Plus why spend all that time making gifts filled with love, only to let them down with boring wrapping? I will definately be printing off some of these free gift tags (tags sometimes are the trickiest to get right in my opinion), I just love the designs so much! #craftblogclub challenge - winter: complete! But then again, I didn't! Because a) the yarn and pattern had been sitting in my room for MONTHS waiting to me used, and b) deadlines helps everyone. Plus the office at work is being decorated so I had a couple of extra days off this week (yippee!) 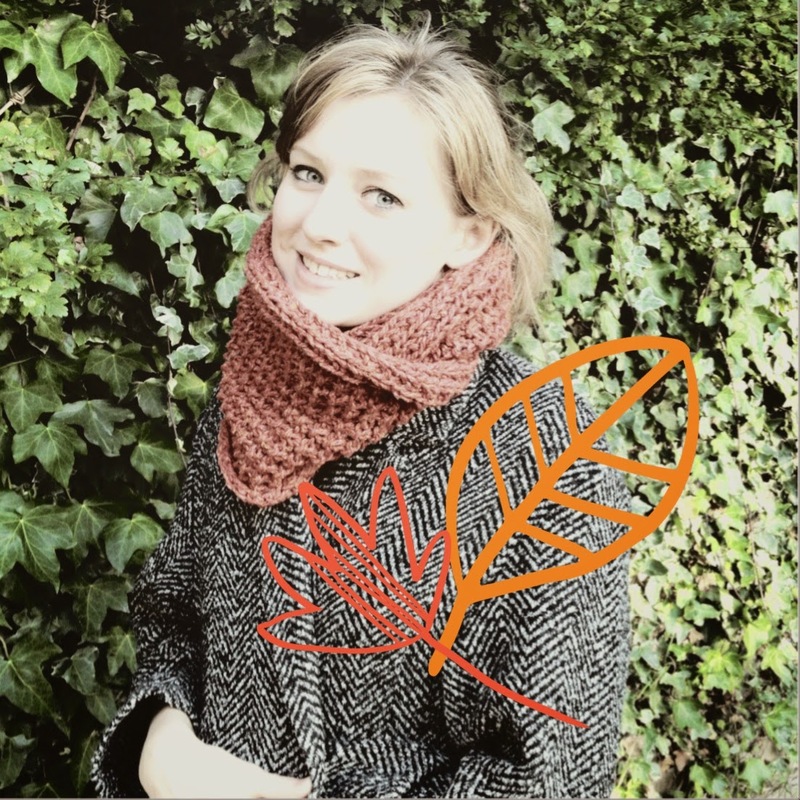 and actually finished this neck wrap fairly quickly (well within the suggested date of 7th October, perhaps I am too early :p). Plus knitting is knitting, and I LOVE KNITTING. This was a very simple pattern (needing only the ability to knit, knit through the back loop, and purl) and I really really love working with chunky yarn and large needles, everything grows so quickly and feels wintery/autumnal! 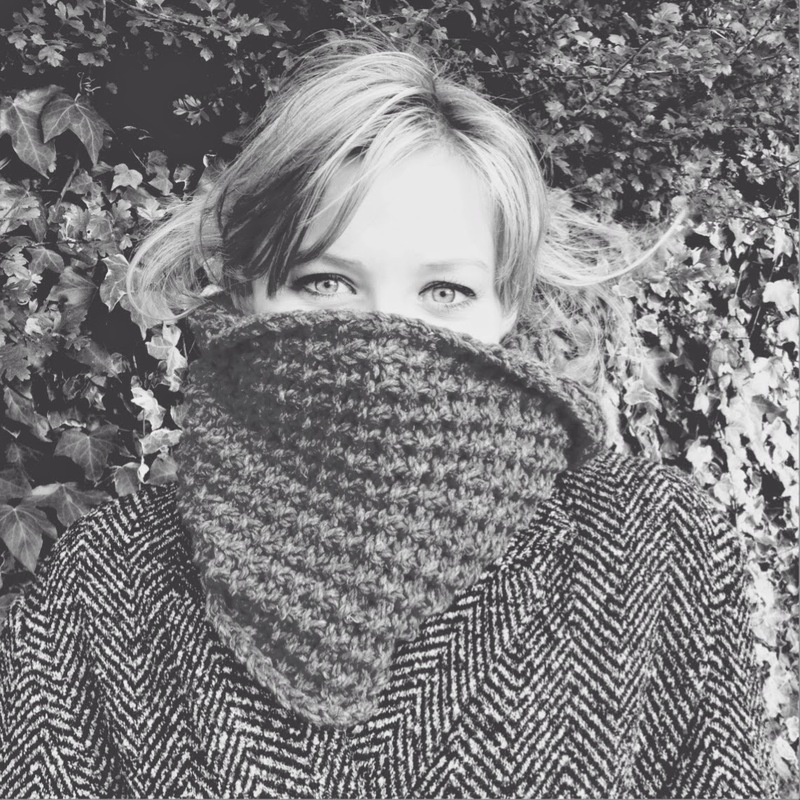 And even though it was simple to knit, the luxury yarn gave it such a wonderful finished look - I've even taken to pretending to be a model in the hopes of showing it off a little bit (thanks to little sis for being photographer! a bang up job done). What do you think? I am very pleased with the outcome and the fact that I was able to finish it up so quickly (might replicate the pattern for some gifts in the future, using another yarn, something from the stash perhaps) and would recommend the yarn to anyone feeling a little flush/next time there is a sale online! Have you joined in the challenge? Please let me know below, I would LOVE to check out what everyone else is making! Last week was B's birthday and I always try and make him something if I can, because I think making something for the people I love is my special way of showing (or trying to) how much I love them. However since beginning crafting I've noticed it is notoriously difficult to decide what to make for the men in my life. This is no ones fault and not some great cry for or against gender stereotypes, I just struggle deciding what to make for them. 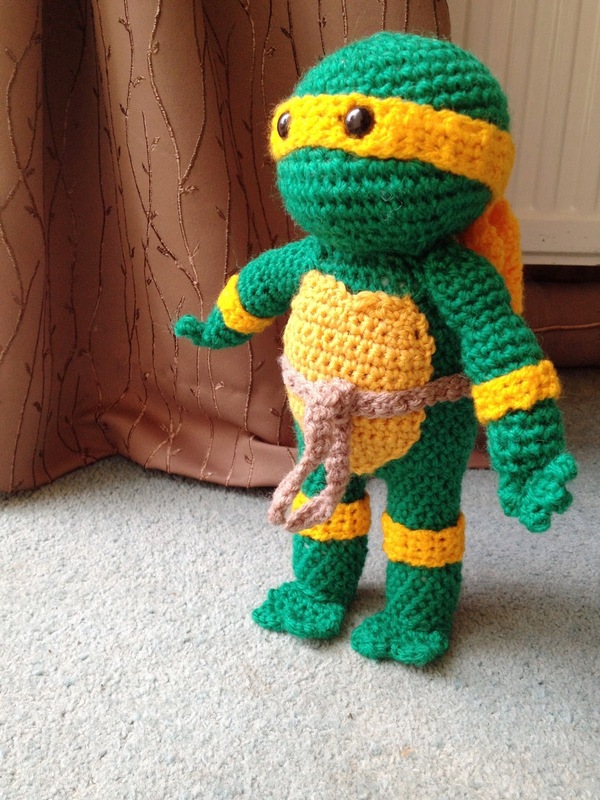 But then I spotted this pattern for the Teenage Mutant Ninja Turtles (TMNT), first on Twitter and then on Ravelry, and it was, quite frankly, a eureka! moment, as B has always loved TMNT and in particular the past year has talked about them more. You may remember seeing this guy in my first ever idea-list post! 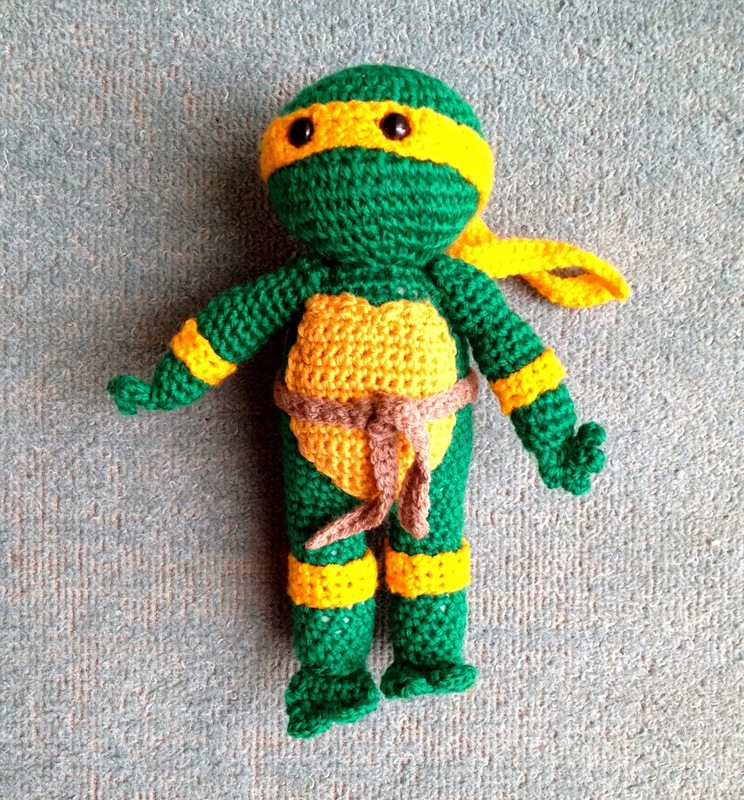 Michelangelo is his favourite character and it was very easy to personalise the turtle as the character I wanted - they have very helpful coloured headbands which make them very identifiable, and luckily I had some orange yarn left over from when I crocheted B a Charizard a long time ago. The pattern is relatively easy to follow, simple increases and decreases and the usual useful abbreviations to help you along, However there are some gaps in the pattern (for example, it didn't mention when and if you should stuff the arms or not, I guessed from the pictures that they needed a light stuffing at least) that make this, to me, an intermediate pattern as you need to be able to fill in some gaps in the rounds an be able to interpret some of the instructions. 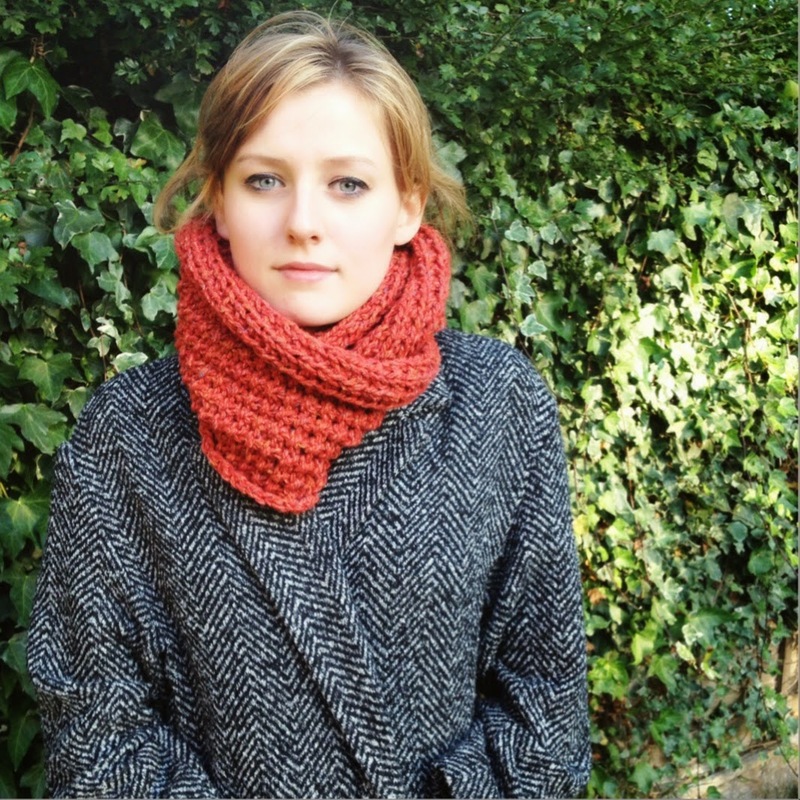 You can find the original pattern on Ravelry, and you can also take a look at my Ravelry project page on Michelangelo if you like! 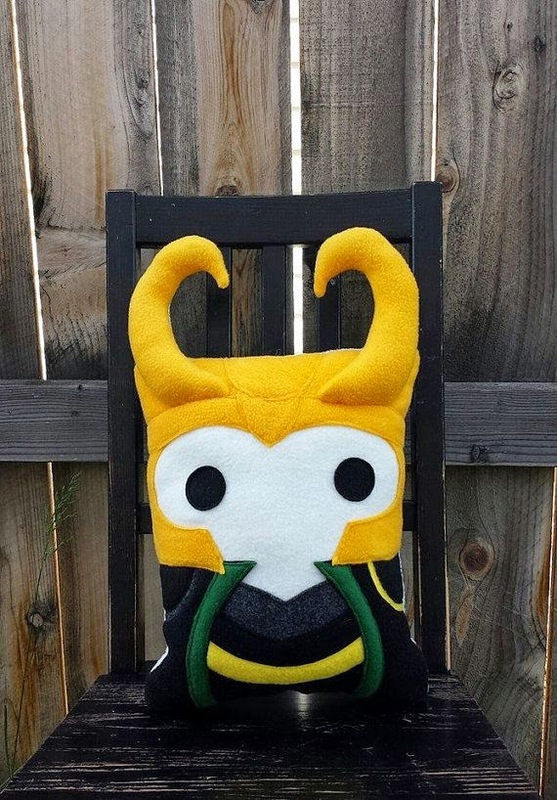 This weeks idea-list is somewhat different in that all of the inspirational pictures I chose from Pinterest are variations on the same item - a wonderful felt cushion - from in fact the same source, the Telahmarie - Heart Felt Design etsy store. 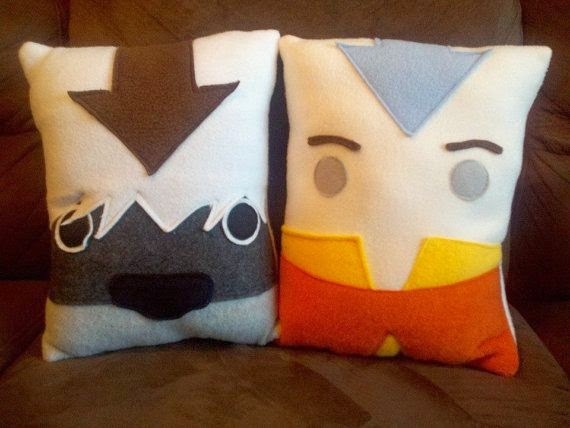 I was just so impressed with all of the designs I couldn't help myself but share them all with you :) Avatar Aang and Appa (above - Avatar The Last Airbender) are easily my favourite designs! And they look so cuddly, Appa in particular. 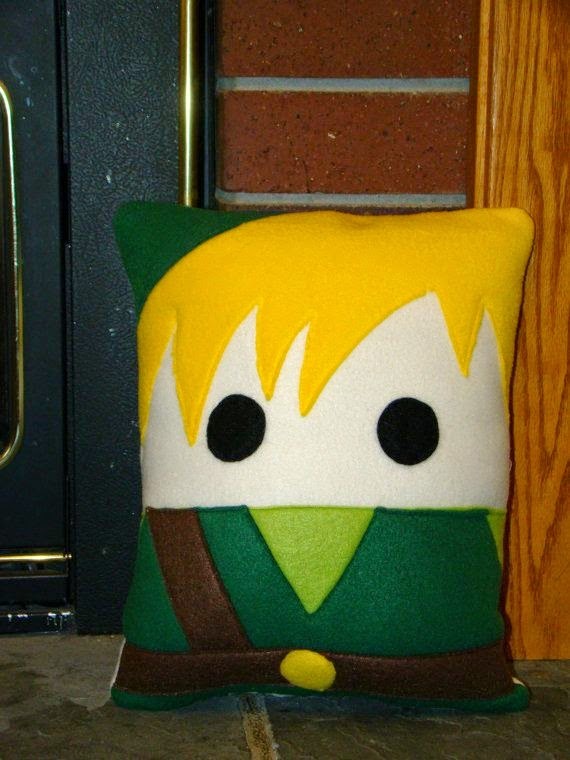 Link (above - The Legend of Zelda) I think has to be my second favourite. The cushion is just so so full of character, even though its all simple shapes and block colours it works perfectly. 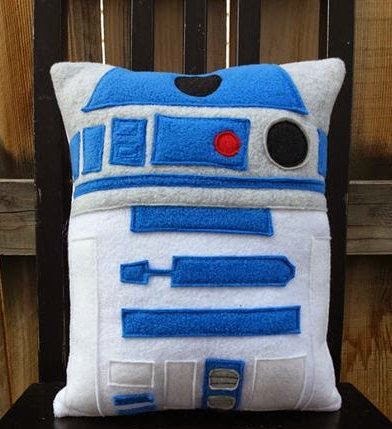 Other favourites are also R2-D2 (top - Star Wars), Calcifer (middle - Howls Moving Castle) and Loki (bottom - Thor) but all the cushions on offer in the shop are really so beautifully made. I've been um-ing and ah-ing about making a Cactuar cushion (Final Fantasy) for a while now, and seeing these made so well has inspired me to get on it, most likely for B's Christmas present. 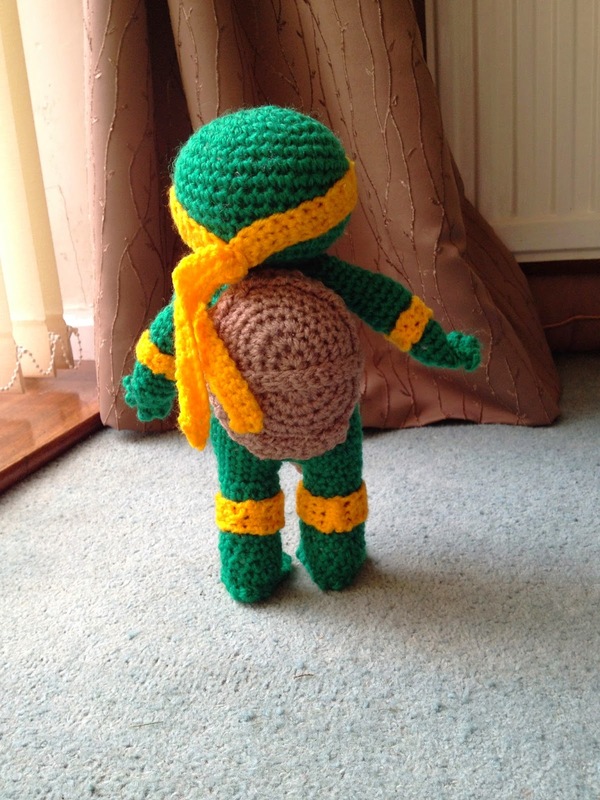 Incidentally I can't wait to show you later this week what I crocheted him for his birthday, he loved it!! 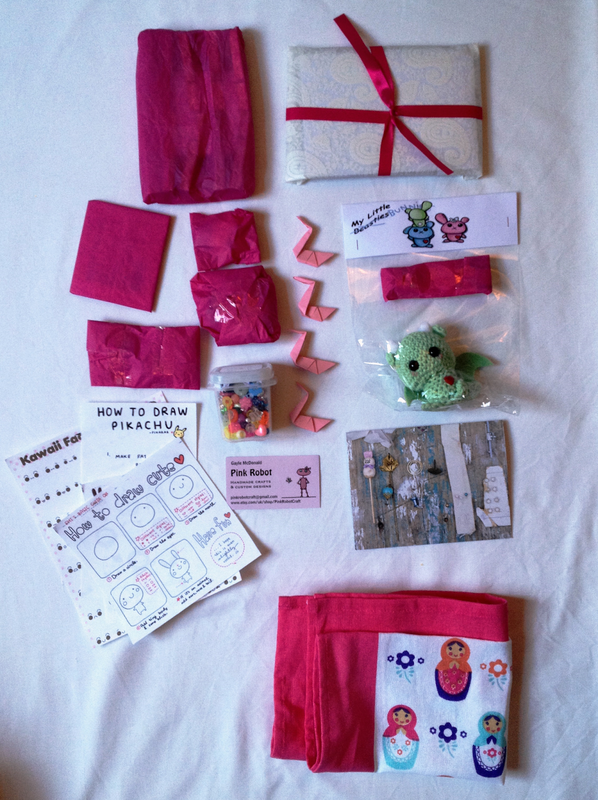 It's that time again to share what I made and received for this month's #DICraftSwap! Every month Hannah over on Dainty and Ivory sets a theme for her craft swap which seems to be growing quite happily! We all give our answers to some set questions by the 15th of the month, and then Hannah uses that to set us up with those who we will send to, and those who will send to us (always different and secret unless you choose to get in touch!). We then post at least one handmade item and one bought itemed valued at £3 or more by the 10th of the next month. If you've been reading up on the craft swaps on here why not join in! There is still time to sign up for this month's theme VINTAGE/RETRO - just drop Hannah a tweet or get in touch on her blog and join in! 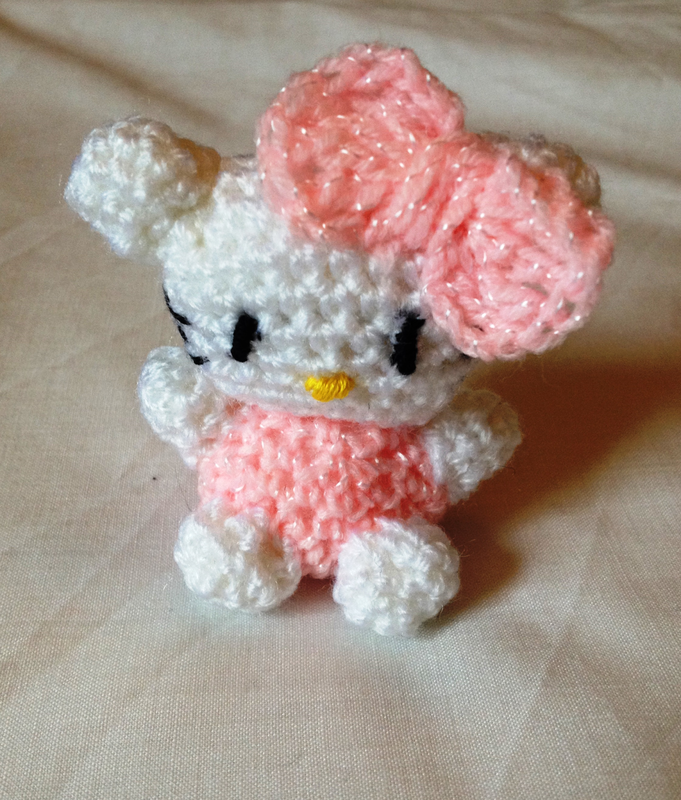 I was asked to send to Kat this month - a self confessed crafting newbie who blogs about her days and her family on her blog Kat Sighs... She expressed a love for Hello Kitty, Japanese candies, and stationary - I hope she liked everything! What do you think? 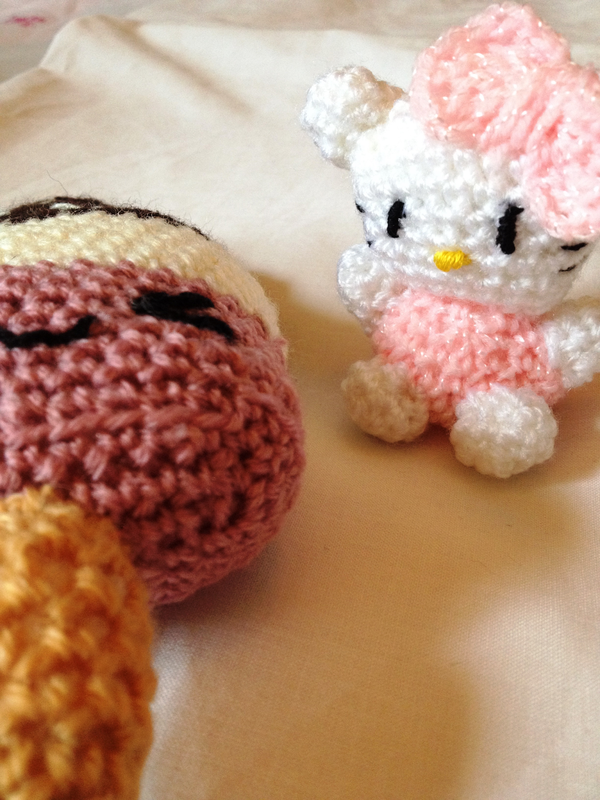 The ice-cream and Hello Kitty plushes are crocheted using yarn from my stash - patterns can be found by clicking on the names above! - and are just rather cute, and for me really invoke the spirit of kawaii, wouldn't you agree? 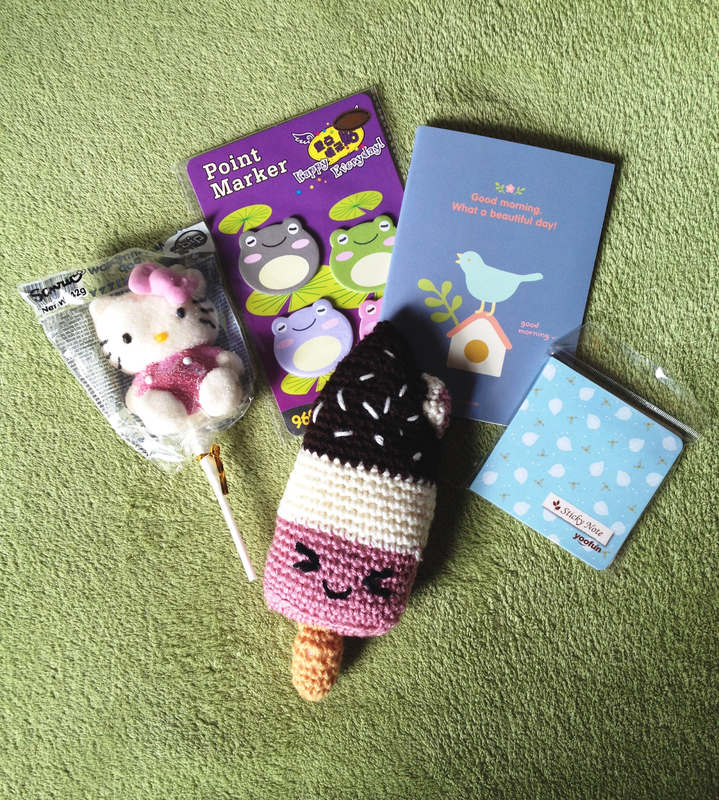 The Hello Kitty marshmallow pop is from Primark (one of those things by the till that I snapped up pronto!) and the stationary is from this fabulous shop on Ebay (I may or may not have bought myself some goodies as well...shh). I folded some paper cranes. to put in the box when posting as well, but neglected to snap a photo as I did it midnight on a work night - oops! I had so much fun making and putting this month's swap together - I'm torn between this and the Disney swap as a favourite! 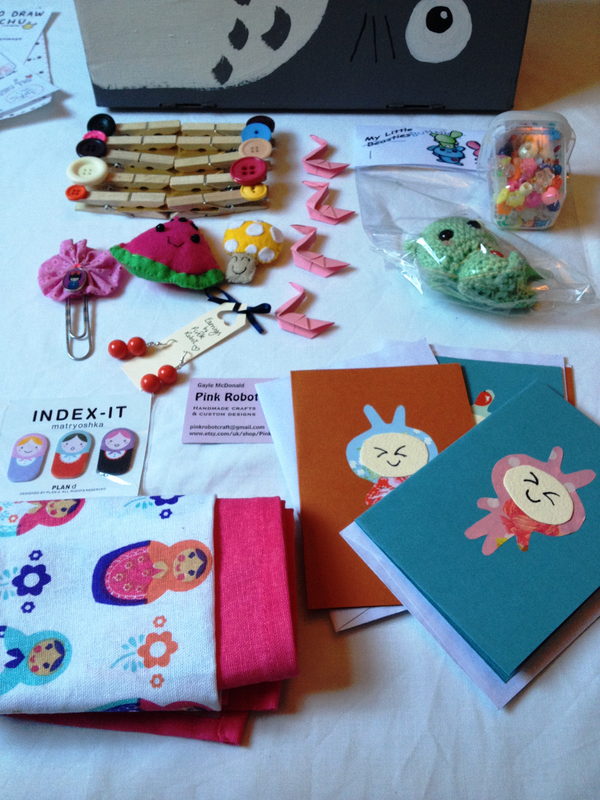 Though the items I received from Gayle - who blogs over on Pink Robot - might might might have just swayed my favour, as it is clear she put such great effort into it and I LOVE IT ALL. 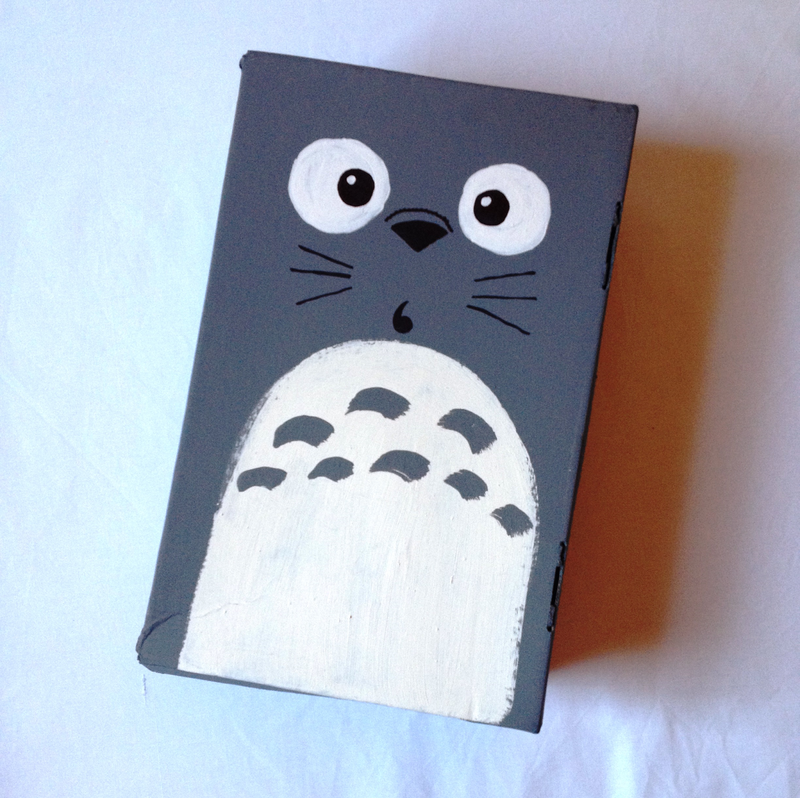 Everything was so beautifully packaged in a wonderfully hand painted Totoro box - I cannot wait to use the box to store my WIPs in!! The presentation of everything this month was absolutely exquisite, I had to exercise all my self-control to take pictures before I ripped everything open giddily! 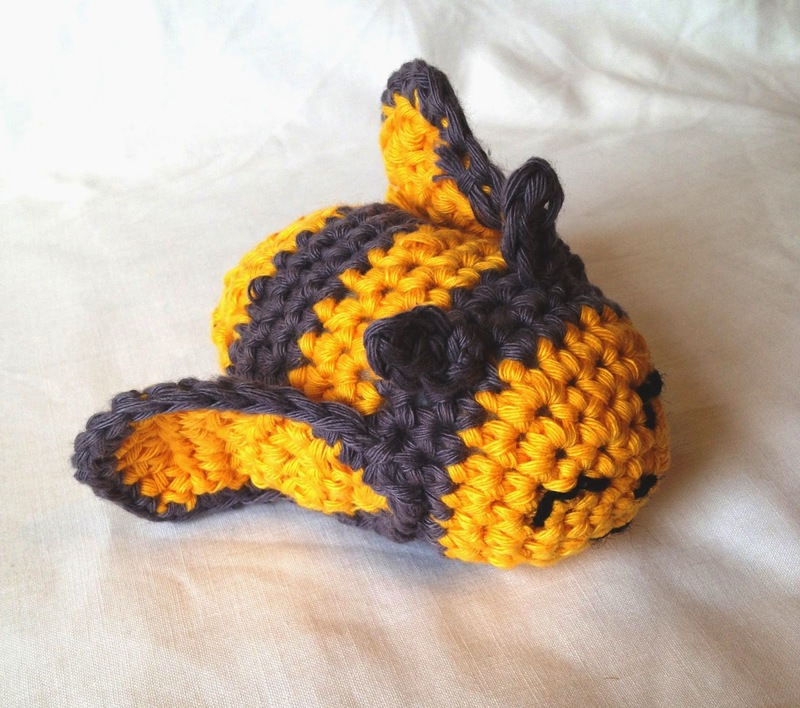 This crochet bumble bee was something I quickly came up with using some left over cotton from a commissioned cushion I knitted. I thought it would be a nice little touch to send along as a surprise extra gift (and I heard back that he was welcomed and named Elvis – hence the name above!) and it was very easy to work up and write a pattern so that you can make one too! As mentioned I used left over cotton yarn – it doesn't take loads so don’t feel the need to buy it in, anything that works comfortably with a 4.5mm hook should be fine (gauge is not important), but cotton does give these gorgeously bold colours in amigurumi! Join grey yarn (or off-white) to the wing at the magic circle and sc all-round the edge of the wing and back to the beginning (approx. 24 stitches). Fasten off and leave a long tail for sewing to the body. Ch4, turn, sc3 back along the chain. 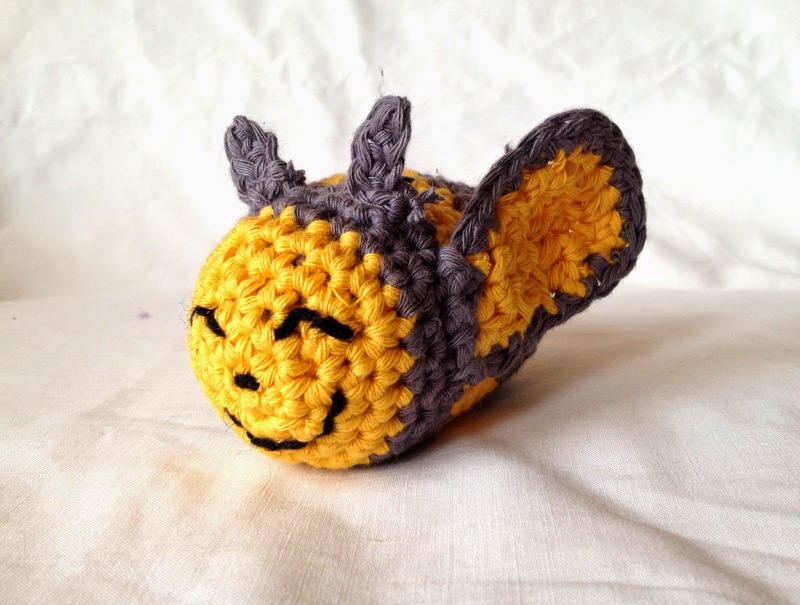 Using the pictures as a guide, embroider a face onto your bee with black yarn that you think will suit its character! 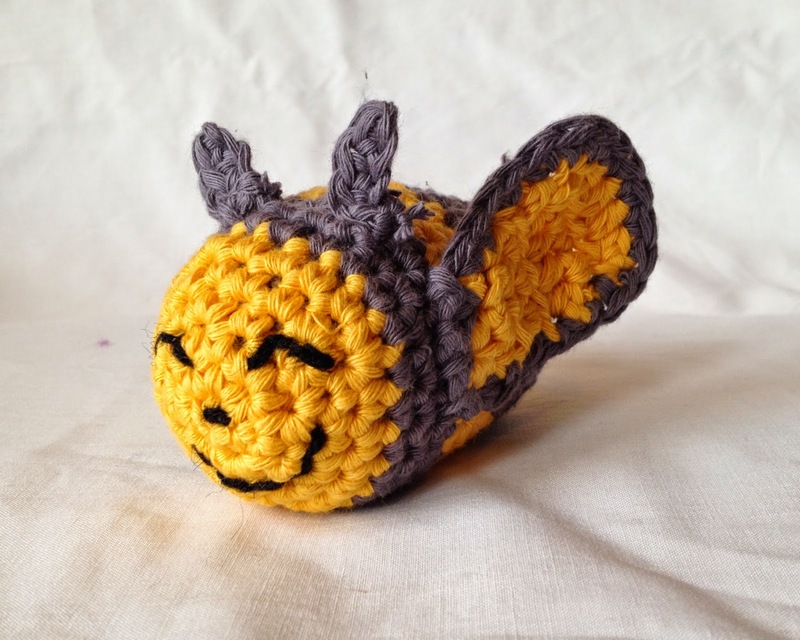 The finished bee is about 8-10 cms long. Will you be making an Elvis? If you do please tweet me a picture or email one to prettycolumn@gmail.com and I would love to share lots of finished ones on my blog! So thing have been a little quiet and on and off on the blog recently. I haven't been able to post all the things I have wanted to and when for a couple of different reason, and I started to get a little stressed out about it because I want this blog to be a success. But then it isn't supposed to be stressful! So I took a step back and mellowed out and just doing that helps a lot. Now I can share with you one of the reasons I was so busy that I couldn't blog. I've been really pleased with the nice comments I have been getting from old acquaintances who just post the odd thing on Facebook that they like my blog and the things I make. One such however went a step further a month or so ago and messaged me asking if I would be able to knit a cardigan for his girlfriends birthday and he would pay for it! 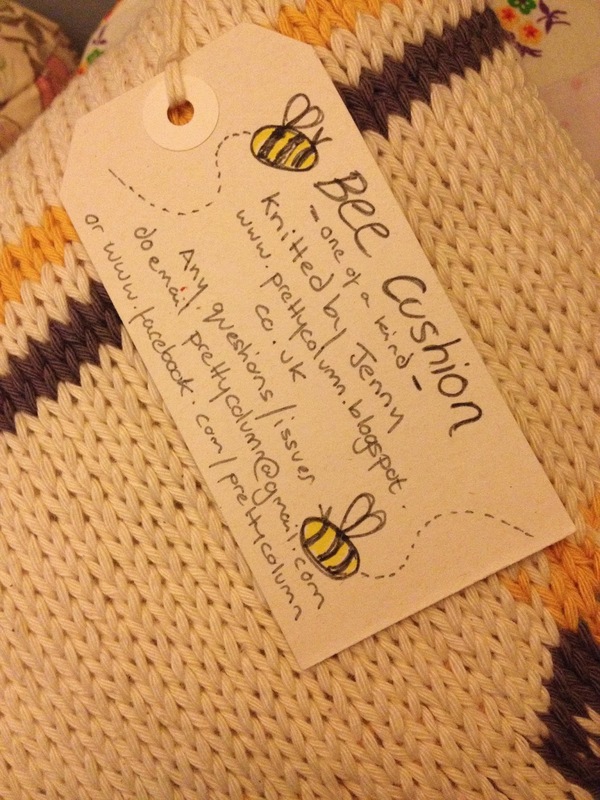 I was touched and so pleased, but had to decline saying I didn't feel I could make something good enough to sell like that, but after speaking he said he would be quite pleased if I would knit a cushion cover for her as a)she LOVES bumble bees (and I don't think there aret a lot of adult bee-themed things out there) and b)a knitted handmade gift would be a little more special. 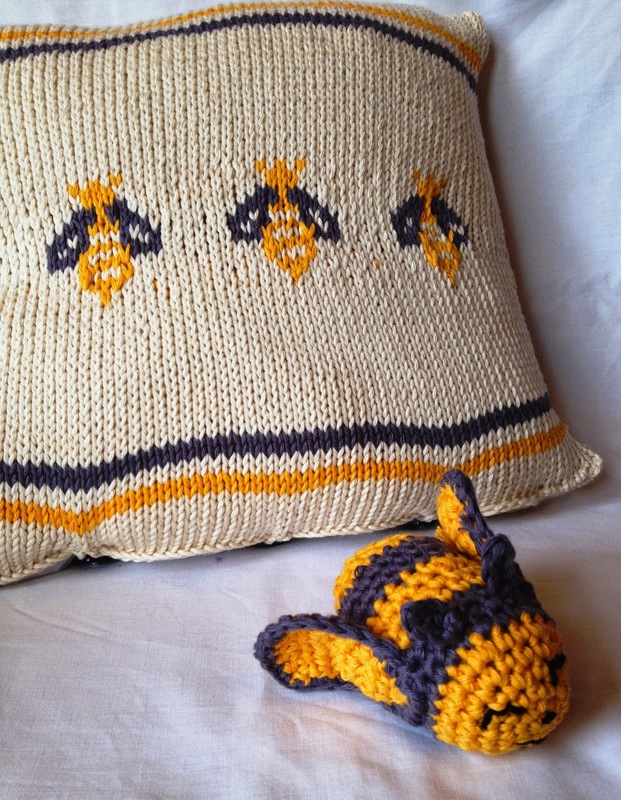 And so with some research - inspired by this adorable children's cardigan - and using this bumble bee chart, I designed and knitted up my first commissioned piece! What do you think? The cushion covers a 40cm x 40cm pad bought from Amazon, and is knitted on 5mm needles using Drops Paris, which is 100% cotton and comes in lovely bold colours (I used 14-strong yellow, 24-dark grey, and 17-off white). 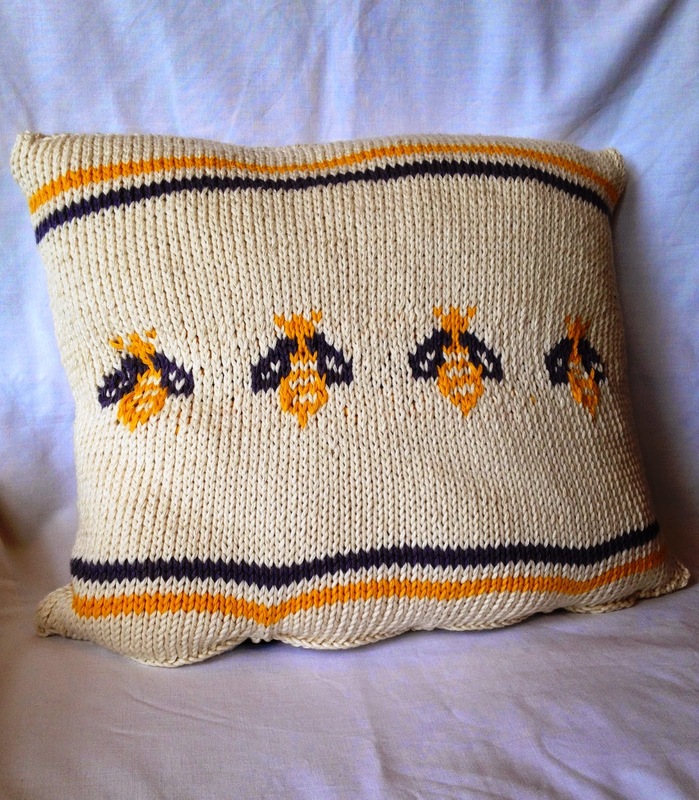 The bee designs are knitted using fair-isle (stranded) technique. I used 3 black buttons along the bottom to complete the opening. 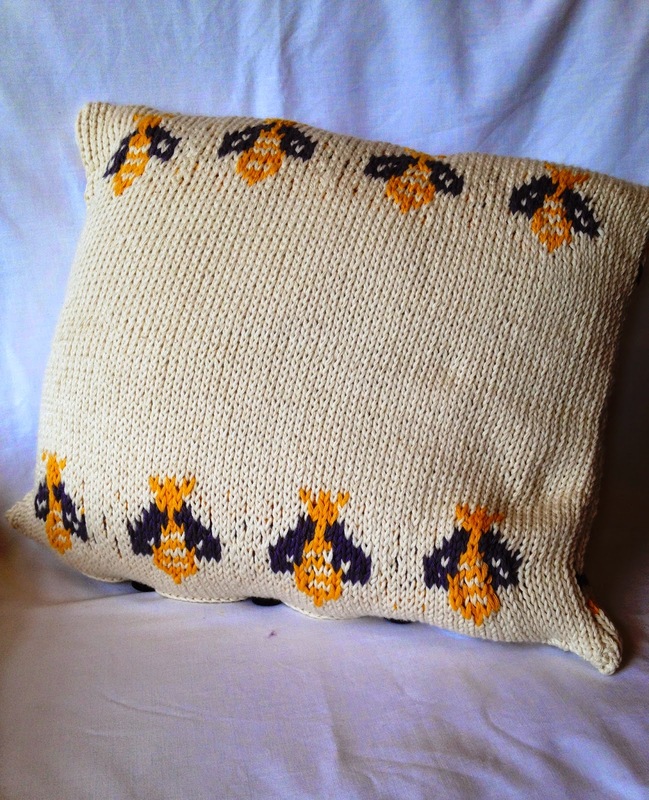 I learnt a lot making this cushion - mainly how difficult fair-isle knitting is using large needles and cotton! I was a little worried that it wasn't as good as it could have been, but I did put 100% into this project and even started again after trying something I knew didn't look nearly professional enough. Once it was all finished, ironed, and sewn up it look 10x better than when it was laid out flat and boring! I am pleased with how this turned out - though I am in no hurry to knit fair-isle with cotton again! 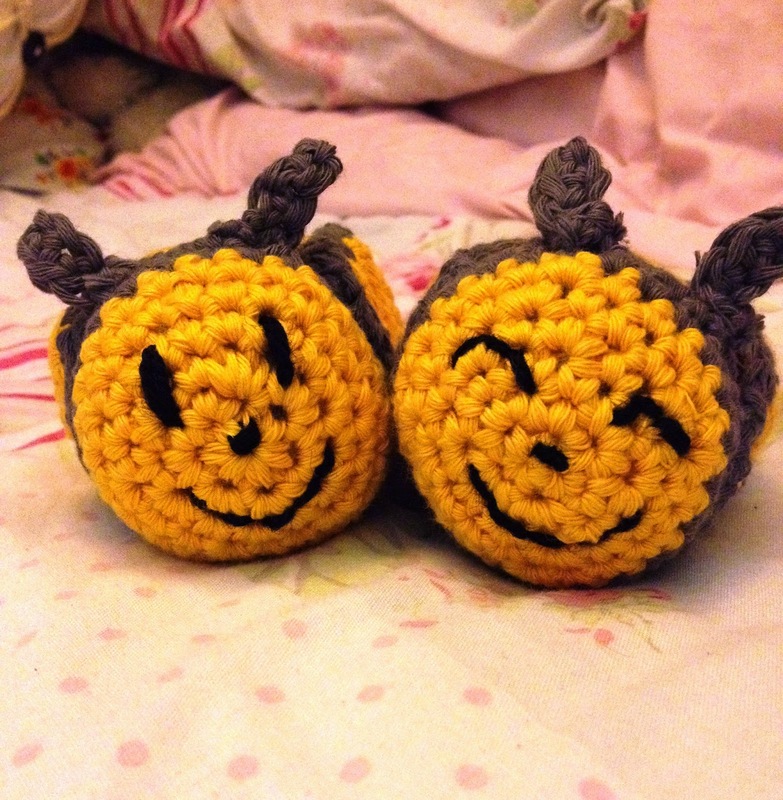 The bee is also my own pattern, which I've written and hope to share on this blog very soon! 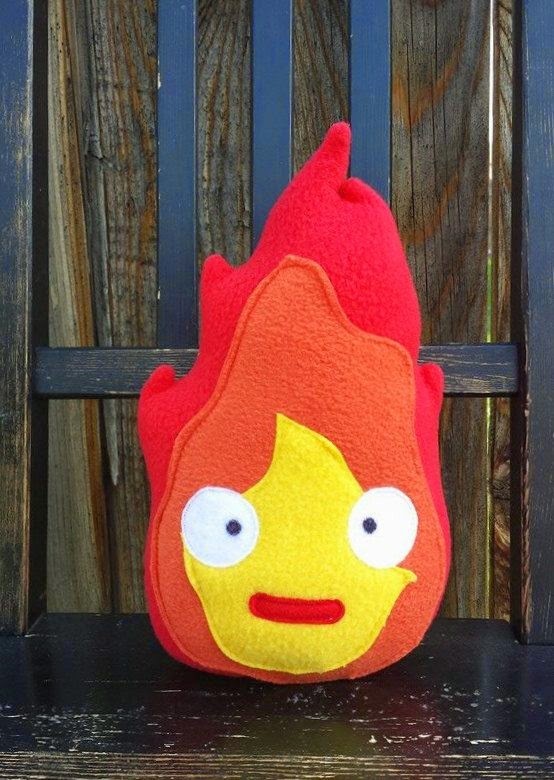 I think I will also put up a practice little guy I made on Etsy to sell. Also, does it make it more suitable now that it is September? Though I don't know about where you are, but here in Greater Manchester Autumn seems to be reverting somewhat in to Summer...BUT I WANT AUTUMN...ok, back to business! 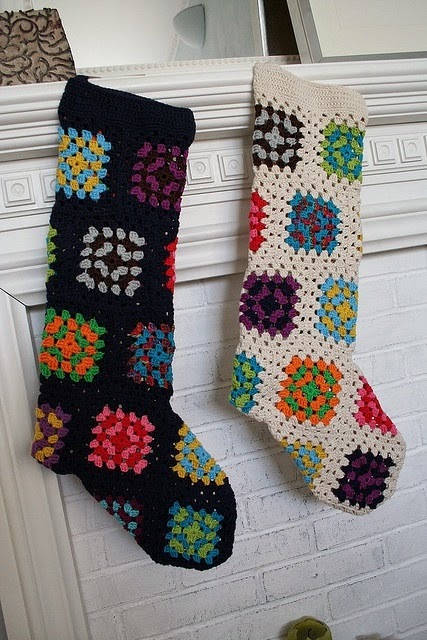 I LOVE granny squares - so easy and beautiful when done well - and these simple-enough-looking stockings really look effective. 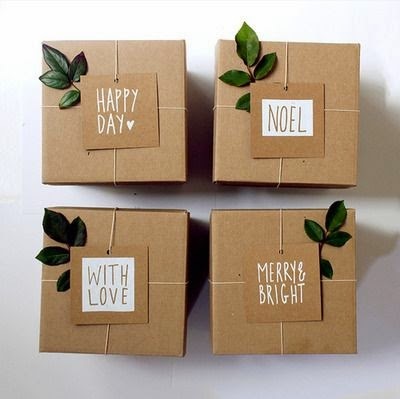 They could be personalised in the recipients favourite colour or in traditional Christmas colours. Although the above image doesn't have a corresponding pattern, it looks fairly simple to copy, or I am sure there are plenty to be found on Ravelry! 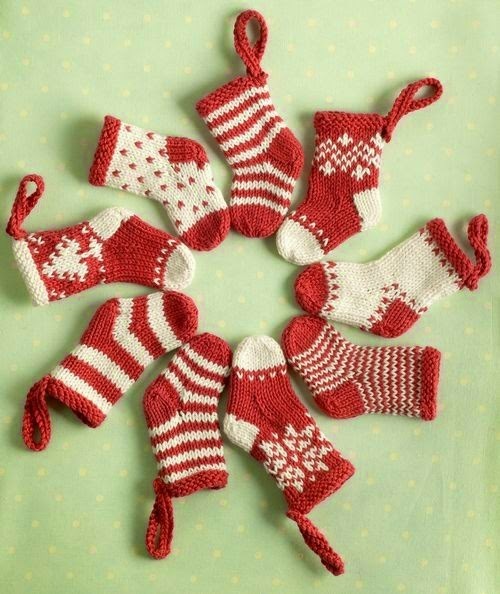 I really fell in love with these knitted Christmas decorations when my friend M started knitting them they year she taught me how to knit (the best thing that ever happened to me - besides B of course!) 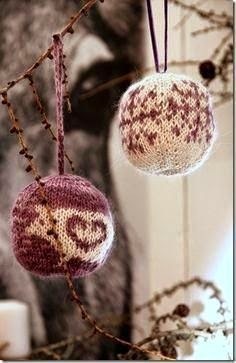 and she used a wonderful book, 55 Christmas Balls to Knit. They are all knitted in the round which has always frightened me a little, but now I know how to knit in the round this is the year I buy the book and get knitting! 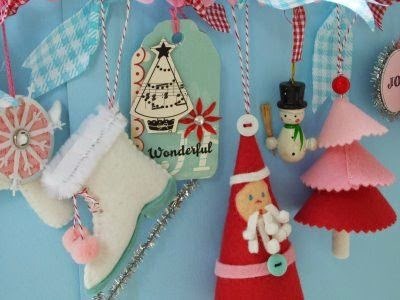 If you want some Christmas inspiration, follow my Christmas Crafts board on Pinterest and lets get giddily excited together! Having done this post - fairly certain there will be one or two more - fair warning! 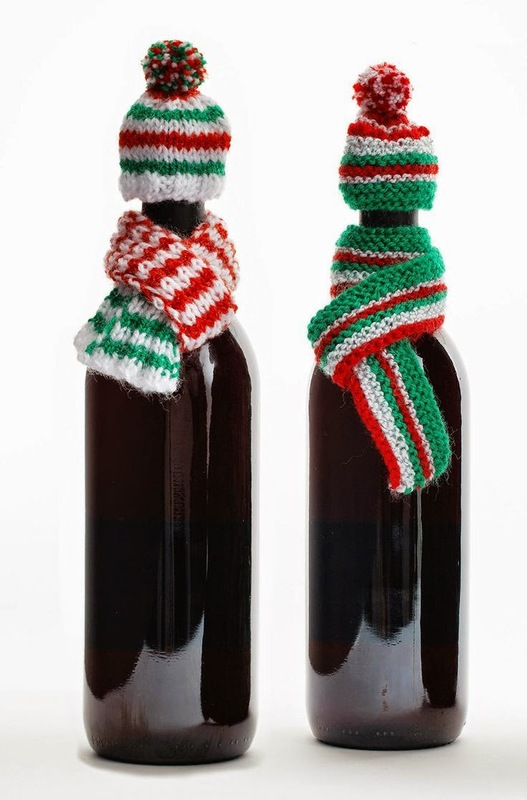 Have you started making your Christmas gifts yet? This month the wonderful-ness that is #CraftBlogClub are hosting another challenge - the ones in the past I have only observed, but this one I want to join in because as soon as I heard the theme I knew precisely what I wanted to make. 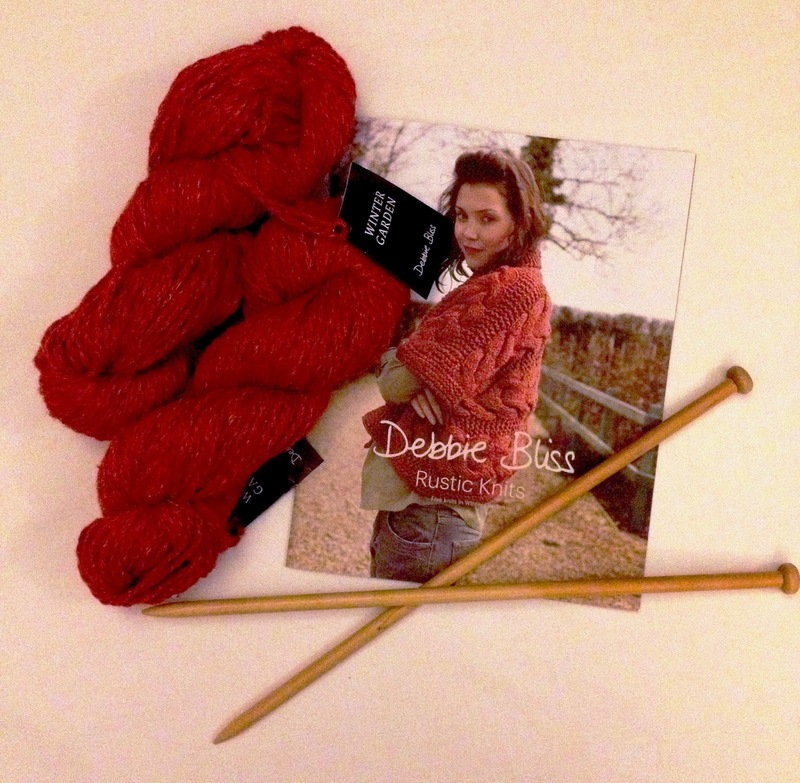 You can interpret this theme however you like - I've decided to knit myself a neck wrap in Debbie Bliss Winter Garden wool, which I received for free when I subscribed to Let's Knit magazine months and months ago, along with a pattern book (picture above). I've never knitted with luxury yarn before so I am very excited! Are you joining in this month's challenge? AND if you have NO idea what #CraftBlogClub is - why not read my blog post on my first go here, and join us on twitter every Tuesday between 7-8/8.30ish for a tweet-chat!